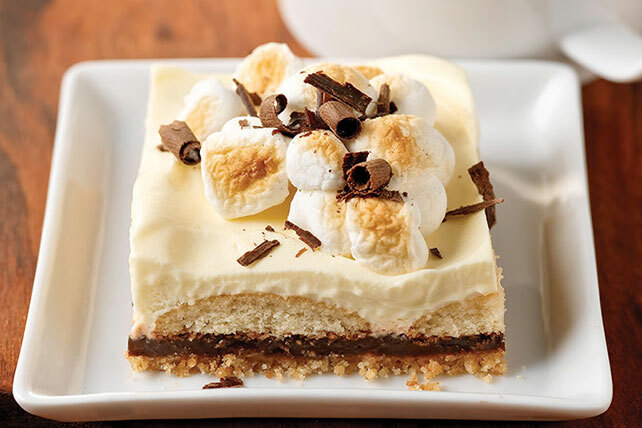 Try S'mores Dessert Squares, a new way to enjoy your favorite ooey-gooey fireside treat. Make these delicious, no-stress S'mores Dessert Squares today! Crush 40 wafers; mix with butter and sugar. Press onto bottom of 13x9-inch pan. Bake 8 min. or until lightly browned. Cool. Beat chocolate pudding mix and 1-1/4 cups milk with whisk 2 min. ; spread over crust. Cover with remaining wafers. Whisk vanilla pudding mixes and remaining milk 2 min. Stir in COOL WHIP. Spread over wafer layer in pan. Refrigerate 3 hours. Heat broiler. Top dessert with marshmallows; broil 1 min. or until marshmallows are lightly browned. Top with grated chocolate. Savor the flavor of the classic campfire dessert in these dessert squares that make enough to be shared with a crowd. Substitute 2 pkg. (3.3 oz. each) JELL-O White Chocolate Flavor Instant Pudding for the vanilla flavor pudding. Assemble dessert in 13x9-inch disposable foil pan. Wrap tightly in plastic wrap and refrigerate as directed. Store in an insulated cooler packed with plenty of ice or frozen gel packs to take along to your party destination. Uncover and top with marshmallows just before serving, then broil as directed.